Have RM65 To Spare? Head On To Any Of These Buffet Feasts, Guaranteed To Leave You Stuffed! Imagine a free flow line-up of food from everything heavenly you can imagine – smoky chargrilled pork strips, fresh flown sashimi pieces to decadent cakes of all flavours and colours! Of course, they can’t all exist in one go (talk about a food overdose) but who says you can’t enjoy them one at a time? 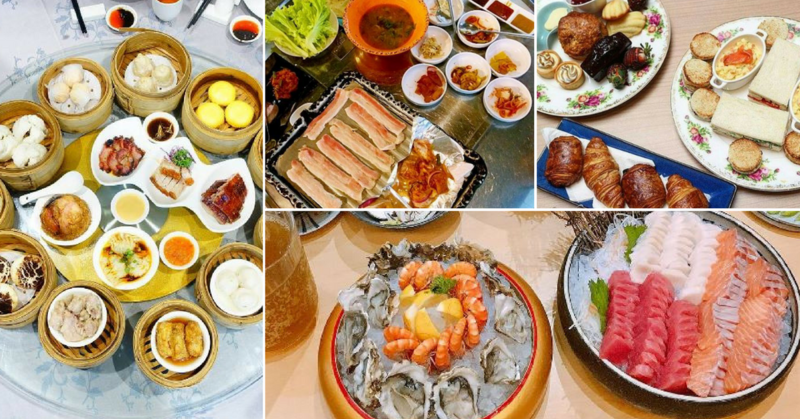 Being the money-savvy peeps we are, we’ve filtered through the list of buffet feasts in KL to bring you these top 6 selections to appease every single diner out there, all under an incredibly affordable price of RM65! Don’t get yourself in a nasty twist when it comes to finances – Secret of Louisana offers an impressive eat-all-you can pasta buffet for only RM21.90++ (weekdays) and RM24.00++ (weekends)! If that’s not good enough of a deal, the establishment also generously include free-flow ice lemon tea, Soup of the Day, garlic toast and garden salad, just to mention a few! For those who’ve never experienced a food baby before, we guarantee you will after just one visit. Gone are the days of forking out RM100+ for a decent Japanese buffet – Mitasu offers a delectable selection from fresh cold cuts to appetizing gunkan sushi at an affordable rate of RM64.50++. Centering along an ala-carte theme for their restaurant, food arrives freshly prepared at the table upon ordering – that means less time walking about and more time devouring! To top it off, Mitasu holds an advantage as they don’t impose limited dining hours for the buffet selection, so we highly recommend you arrive early and spend the hours slowly chewing off sashimi cuts. If you’re the kind of person who’s not afraid to sweat it out for food, Zip Bap’s simply the perfect setting for you. Made for large groups, nothing signifies true friendship like bonding over sizzling meat slices while sipping on refreshing Korean Soju. Of course the alcohol are counted separately, but with RM35 you’re in for a major treat of porky delight, along with free-flow appetizing side dishes and not to mention, ice-cream for dessert. Oh food, glorious food! There’s no need to look far West for authentic French fare – 2OX has got your culinary needs covered with their scrumptious selection of desserts and sweet treats worthy of the Queen. Don’t forget to lift up that pinkie and clink fancy tea cups against a backdrop of triple-tiered treats, consisting of crackling meringue tarts, buttery scones and madeleines just to name a few. Found yourself salivating already? Don’t hesitate any longer and head on to Sky Palace Restaurant for a tantalising fare of dim sum selection, only at RM58 nett. From famous Hakka claypot delicacies to Cantonese steamed treats, you’re sure to be spoilt for choice!